This is a simulated observation of a massive star viewed along the plane of the disk. This visualization of dust emission traces the density and temperature of the gas cloud that surrounds the star. The regions that are currently ionized (in red) and have been ionized in the past (blue structures) show how the nebula flickers. 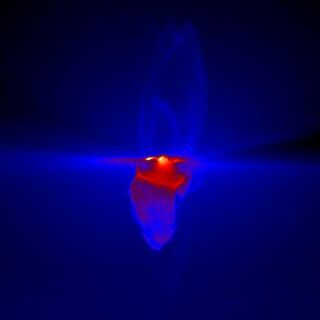 The clouds of gas from which massive stars form will flickerlike a candle over the course of thousands of years, as the star's radiationhits dense structures in the clouds, new simulations show. One aspect of the formationof massive stars ? those 10 to 100 times the mass of the sun ? has puzzledastronomers for decades: How do they get so big without blowing away all thegas around them? All stars form from the collages of huge, spinning cloudsof gas. Once the density and temperature of the nascent star are highenough, the new star begins to fuse hydrogen atoms into helium ? the process ofnuclear fusion that fuels stars. While smaller stars don't begin burning untiltheir natal cloud has completely collapsed, most massive stars begin to shinewhile the clouds are still collapsing. The ultraviolet light from those big stars ionizes thesurrounding gas (ions are atoms with an electric charge), forming a nebula witha temperature of about 18,000 degrees Fahrenheit (10,000 degrees Celsius). Suchintense radiation would be expected to blow the rest of the gas cloud away,which would cause the growth of the massive star to taper off. But this wasn'tthe case, researchers found. Thomas Peters, a researcher at the University of Heidelbergin Germany, ran computer simulations of massive stars in the act of forming andfound out why the massive stars don't blow away all the remaining gas. His study found that the gasaround massive stars does not fall onto the star evenly, instead formingfilmentary concentrations where the gravity of the gas causes it to collect inclumps. These filaments of gas absorb the star's ultravioletradiation as it passes through, shielding the rest of the surrounding gas. Theshielding explains how gas can continue to fall into the tar, as well as whyionized nebulas appear to so small, in the view of radio telescopes. Thenebulas shrink back as they lose their ionization. Over thousands of years,this shift makes it look as though the nebula were flickering like a candle. The finding, detailed in the March 10 issue of TheAstrophysical Journal, has implications for how astronomers interpret the ageof massive stars. "So far, these ionized nebulae were just thought to beexpanding bubbles of hot gas, and the measured size of these bubbles was usedby observers to infer the age of its central star," Peters said. "Ourresults are of particular importance because the simulations show that thereis, in fact, no direct relation between the size of the nebula and the age ofthe massive star, so long as the star is still growing. This is the case over asignificant fraction of the total lifetime of a massive star."